Since 1982 we have been celebrating the International Day of Peace. You must be wondering how all of this started. The International Day of Peace was established largely due to the United Kingdom and Costa Rica that sponsored the resolution 36/67 passed by the United Nations General Assembly in 1981. In 1982 it was observed for the first time. Initially, the International Day of Peace was held every third Tuesday of September – on an opening day of the annual sessions of the United Nations General Assembly. Nevertheless, in 2001 a fixed date of celebration has been set on September 21st. The celebration of the International Day of Peace starts when the Secretary-General of the United Nations tolls the United Nations Peace Bell (this is one of 50 identical copies of the bell from Hiroshima) located at UN Headquarters in New York City. The Bell bears an inscription saying: Long live absolute world peace. The aim of establishing the International Day of Peace is to draw society’s attention to the need to honor and preserve world peace and to oppose wars. September 21st is supposed to be a day of global ceasefire and non-violence and aims to encourage all the countries to refrain from any acts of hostility. 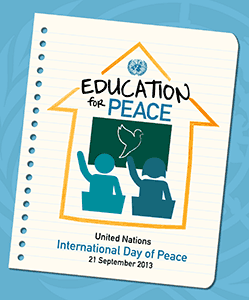 The Secretary-General of the United Nations, Ban Ki-moon, has dedicated this year’s Peace Day to peace education in an effort to focus minds and financing on the problem of peace education as the means that can bring about a culture of peace. In May this year, a global campaign Armed with the Arts was launched in order to increase awareness of Peace Day and promote peace education within schools and local community groups through the Peace Crane Project. More information on the International Day of Peace can be found on the website http://www.un.org/en/events/peaceday/. On this occasion EFHR would like to announce a contest! In order to enter the contest, you must send a photo which, in your opinion, presents a subject matter and the values of Peace Day to the email address info@efhr.eu, putting “Konkurs – Peace Day” in the subject line. We are waiting for your ideas till September 25th. We will select 2 the best photos from the applications submitted. Their authors will receive a prize – cinema tickets. The results will be published on September 27th. We invite you to take part in the contest and we are looking forward to your ideas!